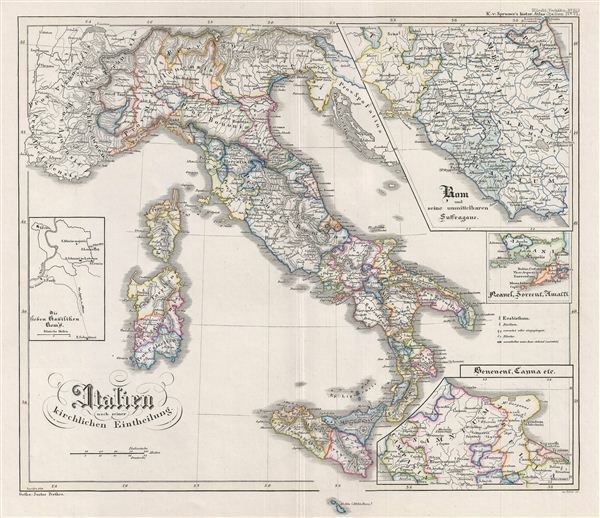 This is Karl von Spruner's 1854 historical map of Italy and its ecclesiastical divisions. The map covers all of Italy divided into provinces from the area of Venice to Malta, including the islands of Sicily, Corsica, and Sardinia. The map additionally features four inset maps, two of the top right corner, one on the bottom right corner and one next to the left margin. The first inset map details Rome and its Suffragan Dioceses, the second details Naples, Sorrento, Amalfi, the third focuses on Benevento, Capua, etc., and the forth identifies the seven basilicas of Rome. These includes the four patriarchal basilicas (including St. Peter's Basilica, one of the holiest Catholic sites, and St. John Lateran's Basilica, the official ecclesiastical seat of the bishop of Rome, who is the Pope) and the three minor basilicas. The whole is rendered in finely engraved detail exhibiting throughout the fine craftsmanship of the Perthes firm. Prepared by Karl Spruner for publication as plate It VI in the second edition of Justus Perthes' 1854 Historich-Geographischer, Hand-Atlas zur Geschichte der Staaten europa's vom Anfang des Mittelalters bis auf die Neueste Zeit.